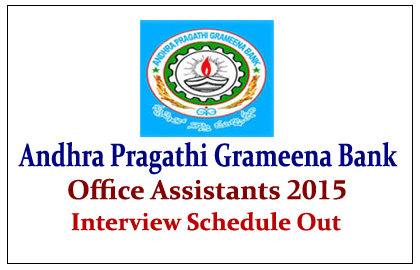 Andhra Pragathi Grameena Bank has announced the Interview Schedules for the Office Assistants. For which the Bank has invited the online application from the candidates for the above mentioned post from 24th December 2014 to 8th January 2015. Now the list of shortlisted candidates for the interview and interview schedule were given here.